The U.S. Government now in a partial shutdown. There is a live shot of the U.S. Capitol. 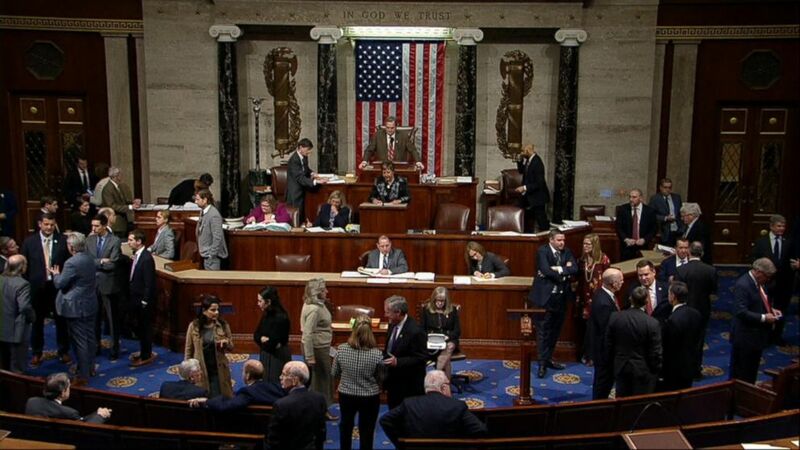 Lawmakers unable to cut a deal before the midnight deadline. They will return in hours to try to break this impasse. White house officials including presidential son-in-law Jared Kushner showing up at the capitol to engage in some last-minute bargaining on Friday. At issue here, funding for president trump’s signature campaign promise, that border wall. And the blame game has begun. President trump says the shutdown is on the Democrats but senate democratic leader chuck Schumer tweeting out this video of the president just last week saying he’d be proud to shut down the government. We begin with ABC’s white house correspondent Tara Palmeri at the white house for us this morning. Tara. Reporter: Good morning. It’s president trump’s third government shutdown since becoming president and his family has already taken off for palm beach. He’s staying behind to try to get some sort of funding for the wall that he promised during the campaign. Overnight the government partially shutting down just days before Christmas. We’re going to have a shutdown. There’s nothing we can do about that because we need the Democrats to give us their votes. Reporter: The deadlock over the president’s demand for a border wall. Let’s advance this legislation, Mr. President. Let’s pass it. Let’s finish our work for this year. Let’s secure our country. Reporter: Despite Republican leadership in the house and senate, the president failing to secure the votes for the $5 billion he needs to start building the wall. You’re not getting the wall today, next week or on January 3rd when Democrats take control of the house. Reporter: The contentious negotiations coming to a head today. As of midnight several federal agencies saw a large part of their funding come to a screeching halt. More than 400,000 federal employees temporarily working without pay. Essential employees in the affected departments like the departnt of justice or homeland security will now have to report for work. For customs and border protection employee bonita brewer, this means her holiday leave is canceled. Where I would be off of work in order to enjoy time with my family, I’ll likely have to report in to the office. Reporter: On Thursday house Republicans approved a spending deal through February 8th allotting 5.7 billion for the wall but the senate barely reached 48 votes needed to bring the bill to the floor. Vice president Mike pence stepping in to break the tie. If chuck Schumer and the Democrats decide they want to force a government shutdown because they’re unwilling to support border security, I think that would be an extreme and irresponsible thing to do. Leader Pelosi, leader Mcconnell and myself have done everything we can to avoid a shutdown, but president trump wants one. Reporter: Last week the president owning the shutdown. I will take the mantel. I will be the one to shut it down. I’m not going to blame you for it. Reporter: But Friday putting the blame back on the Democrats. It’s up the to the Democrats so it’s really the Democrat shutdown. Mr. President, what’s the next step? What will the president accept? I’ll keep you posted. Back now live with Tara. The house and senate are back in session at noon today. Any sign at this point of a deal in the works? Reporter: Well, a lot of these lawmakers have gone home for the holidays. They will be given 24-hour notice when it’s time to come back for a vote so expect this to last well into the weekend. Tara Palmeri at the white house for us today. Tara, thank. So much to talk about. Let’sably in a ringer, Matthew dowd. Matthew, good morning. Given we’ve got lawmakers who aren’t even in Washington and many on both sides showed no signs of budging here, how do you see this impasse ending? Well, I’m hopeful this is like other shutdowns where it lasts one, two or three days but the problem is you just mentioned is Christmas eve is two days away, Christmas day is three days away, and most people have left town though they could get them back in a relative hurry, I’m hoping they come to a short-term agreement where it extends this and keeps the government open until February, which is the original deal that everyone seemed to have agreed to, but there’s no telling what’s going to happen. Everybody is lined up in their corners and the president as was mentioned in the run-up to this has said that he is responsible for the shutdown up until the last 24 hours, so it’s going to be up to the president to compromise on this. If we’re going to get the government back open before Christmas day. If this thing drags on do you think the president takes the blame for that and does it matter? Do the American people remember who caused which shutdown? We’ve had so many of them. Well, I think it matters in two ways, first is the president already said in his own words, he’ll take it, it’s on him. He’s responsible for this, and I think it feeds the story line on the president that there is a level of incompetence and disarray and dysfunction in this white house and this administration. So, one, I think it hurts him there, but, two, I think it hurts all of Washington because it looks like Washington can’t get the job done. Huge issues to be handled, infrastructure, immigration reform, the budget, all of those things, it looks like Washington can’t handle it and the president is on the top of the heap, the power of Washington, D.C., so ultimately the blame will fall on him and any political problem will fall on the president. Let’s talk about the issue that appears at the center of all of this, the border wall. This was the signature campaign promise for Donald Trump. He mentioned it at every rally. He said we’re going to build the wall, the Mexicans are going to pay for it. If he doesn’t get it, if he doesn’t get the funding for it right now, will he ever get it given that Democrats are going to take over the house of representatives in the new year? Well, most people have said that they think it’s impossible come January 3rd when the Democrats take over the house. I actually take a different look at it. I actually think he could get it done but what he’s going to have to do which he hasn’t done is compromise on some big issues so I think the Democrats would go along with a wall if he allowed immigration reform, a path to citizenship, something he’s been opposed to so now he can get the wall, but he’s going to have to do a series of compromises and I actually think that could benefit Donald Trump politically if he was willing to basically say I can get my wall but I’ll have to give on some big things. Matthew dowd, we always appreciate your analysis on a Saturday morning. Thank you so much.